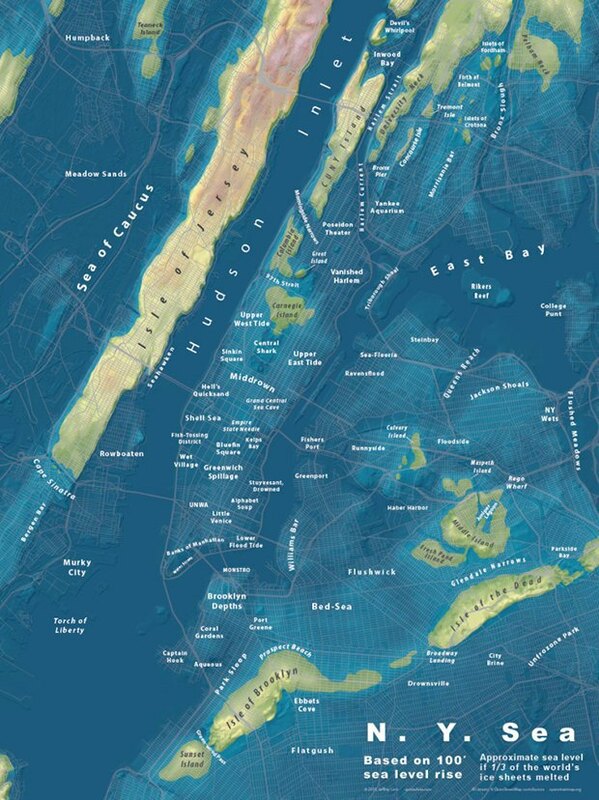 Sunset Park and Park Slope win the award for last NYC neighborhoods standing, at least according to a new map made by Jeffrey Lin which demonstrates how extreme sea level rise will impact major cities. Using his background in urban planning and geography, Lin has created virtual doomsday maps of London, Montreal, LA, Portland, and more that depict the irreversible effects of climate change. (See more on his website.) As for NYC, when one third of the world’s ice sheets melt, at least you’ll have Union Hall. "The numbers I used to determine the sea levels in my models were taken from a USGS study on possible sea level rise," Lin explains. "According to this USGS data, the total possible sea level rise is 80.32 meters, or 263.5 feet. In these maps, I may render a sea level lower than the maximum and still call it 'all', just for simplicity’s sake in the description. I never render sea levels higher than what is possible from melted ice according to the USGS." Check out Lin's portfolio here.